What do you give the guy who has everything, from an entire religion to a Mercedes with a bulletproof glass room on top? You give him a drone. And that’s exactly what some grade school kids from Rome did on Thursday. 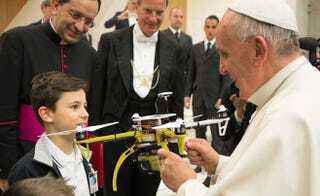 But what will the Pope do with his new Popedrone? Will he do humanitarian work in Africa? Will he take stunning aerial video of the Vatican? Will he hang it on his wall like a taxidermied bird of the future? He’ll probably just crash it like the rest of us. And sell its tattered remains for charity.